I was so busy looking at his awesome helmet, blaster rifle and jet pack, I have no recollection what Boba Fett was wearing on his feet. While I’m guessing he donned some sort of military boots, I’m pretty certain they didn’t look like this. These handpainted Boba Fett Toms shoes look comfy enough, and will slip onto your feet faster than you can say “Sarlacc Pit.” They’re made by GeekyFootwear, and perfectly capture Fett’s iconic helmet design – except on your feet instead of your head. I don’t much care for using them to stomp on Chewbacca’s head though. Actually, I’m pretty sure Chewie would rip off your arms (and legs) before you could even attempt such a feat with your feet. But anyhow, I digress. 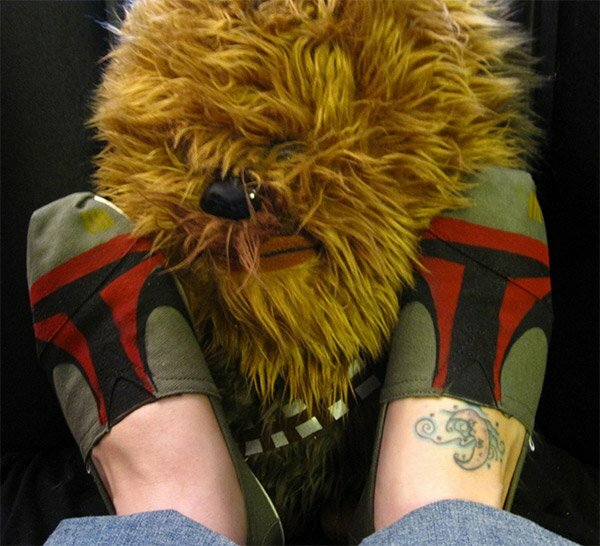 If you’d like some Boba Fett shoes for your feet, a pair will set you back $80(USD) over on Etsy.